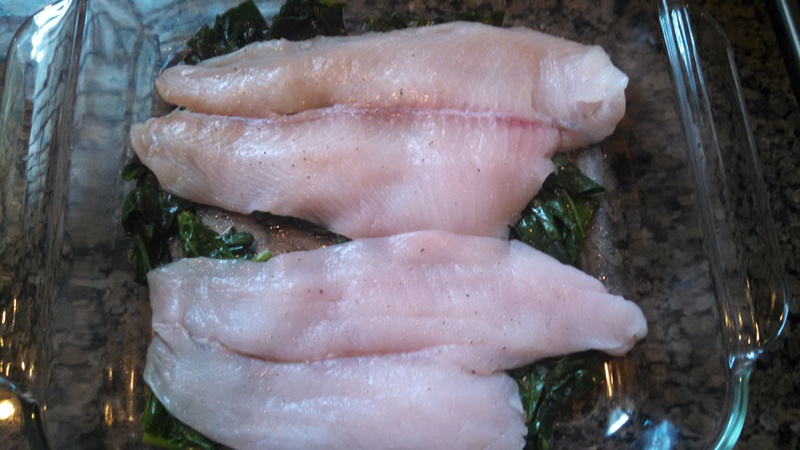 When floundering (pun intended) about for a dinner recipe recently, I flipped briskly past Flounder Florentine, thinking it would be far too complex for me – requiring numerous steps and ingredients. Two things brought me back to it: first, I have been trying to incorporate fish often when we eat at home because it is a lean, healthy protein. Nick and I have both been traveling pretty extensively and it’s opened my eyes to how difficult it can be to maintain a healthy diet on the road. Even “healthy” dishes are typically made with larger quantities of salt, butter, and/or other ingredients than I would be using at home. Second, flounder is Nick’s favorite fish (and I do try to accommodate his preferences when possible). On my second, longer look, I was pleasantly surprised by the brevity of the ingredient list, and I decided to take it on. I made brown rice, seasoned with fresh lemon juice and zest, as a side. This recipe comes from the Maine Summers Cookbook, and the original recipe serves 6 – I made only enough for two people, and my division wasn’t precise. It still turned out well! Spread the cooked spinach on the bottom of a large, broiler-proof baking dish. Arrange the fillets on top. Melt the butter in the top of a double broiler. Add the flour and stir to blend. Slowly add the milk, stirring to a thin white sauce consistency. Add enough parmesan for a medium-thick consistency, stirring until smooth. Season with salt and pepper. Pour the sauce over the fish. Bake for 20 minutes, then turn on the broiler and broil for an additional 3-5 minutes to brown lightly. Dinner without wine? Not in this house! 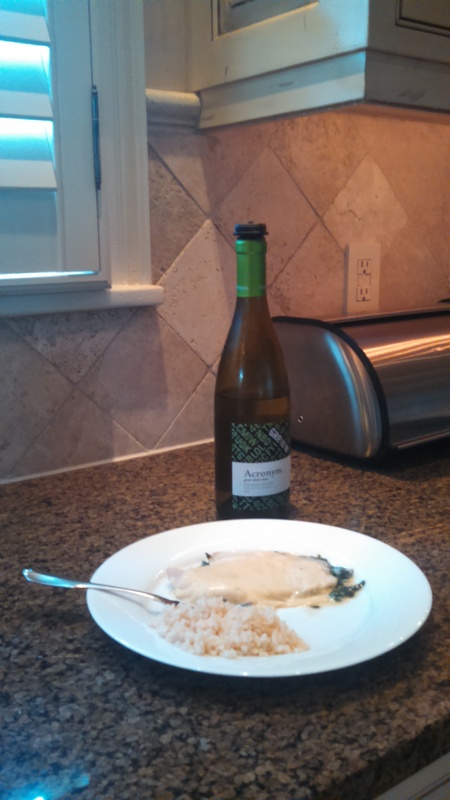 I served the flounder florentine with a Chardonnay by Acronym. Flounder is a very light fish, and served this way, I think a Pinot Grigio may have been a better match – but I love Chardonnay so it made me a happy girl! 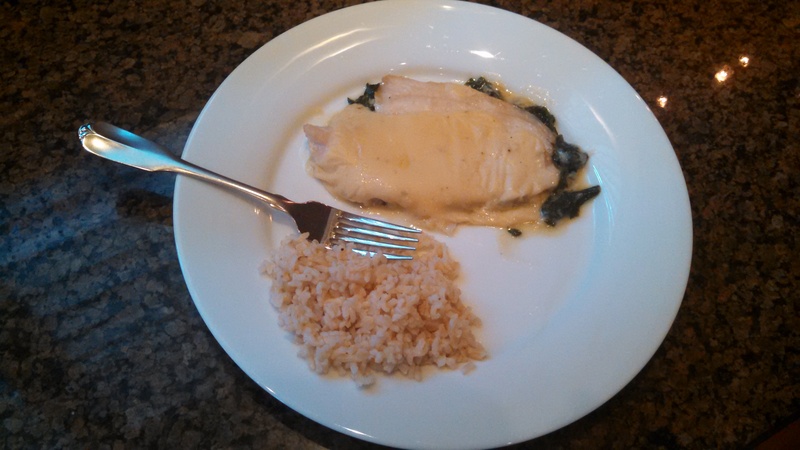 This dish was very good, and it was also fairly quick to prepare – a must on week nights. I do think that I might add a splash of white wine to the sauce next time – while it was tasty, it was missing a little something (for me, anyway). Categories: Drink, Eat, Weekly Recipe | Permalink. I was on the verge of beginning this post with, “My favorite season in Maine is fall..” when I realized that would be a lie. Not because summer is my favorite… or winter… but because my favorite thing about the seasons in Maine is that I can’t choose just one. I frequently reflect on how fortunate I was to grow up in a state with four distinct seasons and numerous opportunities to enjoy each one, indoors and out. Although it’s only mid-August and there’s still a bit of summer (and Indian summer) to savor (“bit” being the operative word), now is the time to plan for your fall getaway in Maine or add activities and events to your calendar if you live there already. Whether you’re looking to take in the radiant colors of Maine’s fall foliage, go for a hike in the crisp fall air, or participate in the revelry of one of fall’s many fairs and festivals, the opportunities are abundant. High on my personal list are the Cumberland County Fair (September 21st – 27th), the Fryeburg Fair (September 28th – October 5th), and general outdoor activities like hiking or biking at Baxter State Park, Acadia National Park, or any of the other scenic locations Maine has to offer. 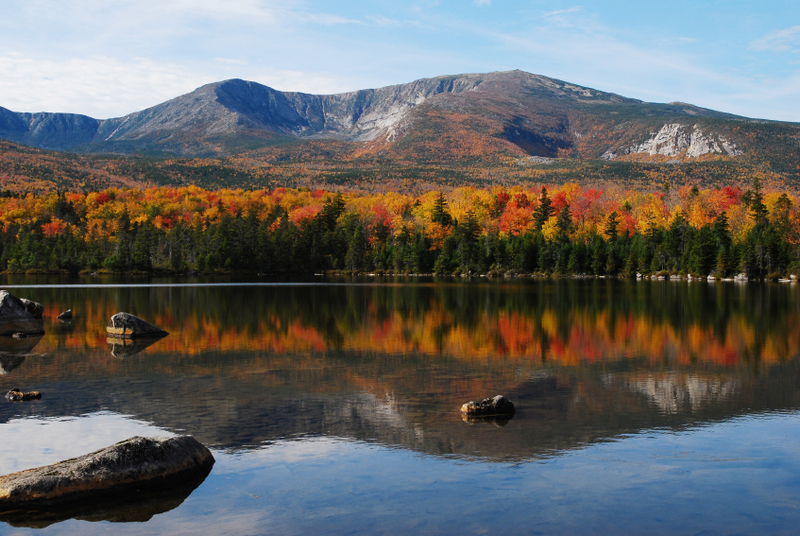 View of Mount Katahdin in fall. International Seaplane Fly-In, Moosehead Lake, September 4th – 7th: Who wouldn’t want to visit beautiful Moosehead Lake in the early fall? It is not only the largest lake in Maine, it’s the largest lake east of the Mississippi contained in one state. This event consists of Float Plane Competitions, educational exhibits, and is the area’s largest craft fair. 13th Annual Fall Festival of Arts and Crafts, Smiling Hill Farm, Westbrook, September 6th: I have many, many childhood memories that involve Smiling Hill Farm – whether it was a visit to see the animals, an educational event, or enjoying their fresh milk and homemade ice cream – we visited regularly. Attend this event (low cost – $2 per adult, children under 12 are free) and meet a number of artisans sharing their crafts. Mt. Abram Ascent, Greenwood, ME, September 6th: This is a 5-mile run up the mountain – a part of the New England Trail Run Series – that will be followed by a celebration featuring an arts and crafts fair, mini-farmers market, and beer from Baxter Brewing Co. I would be doing this in a heartbeat if I was in Maine! The bottom line is – get out, get to Maine, and partake in this season of harvest and outdoor fun before the weather drives us inside to wait for spring (unless we exit the house armed with one or more of the following: shovel, snow shoes, skis, ice skates… you get the idea). Categories: Eat, Play, Shop | Tags: craft fair, Cumberland Fair, events, fall, Fryeburg Fair, Maine, Moosehead Lake, seaplane, Smiling Hill Farm | Permalink. A consistent theme in my Maine cookbooks are the venison variations in recipes that traditionally call for beef. 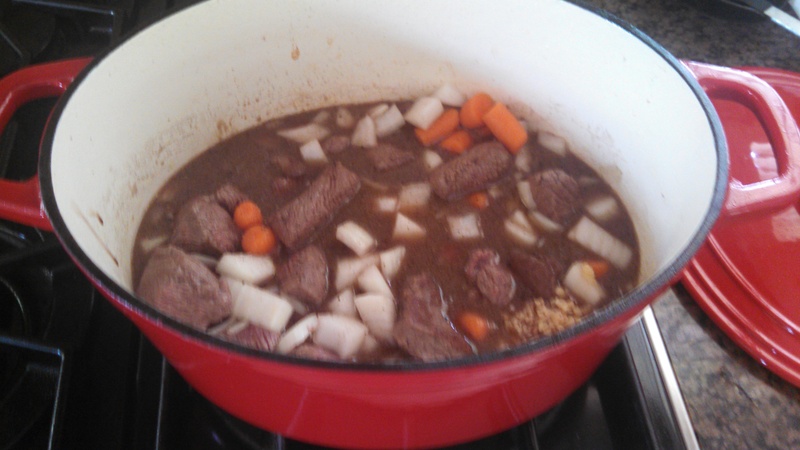 Once hunting season arrives, I may actually be able to try the venison version, but for now, I’m making this dish the traditional way – with beef. Found on page 97 of Maine Home Cooking (which has quickly become competition for Recipes from the Maine Kitchen for the “favorite Maine cookbook” honor), this recipe delivered truly outstanding results – validated by my mom’s experience when she made it for her dinner group. I’ll be honest, when I first reviewed the ingredient list, I was concerned that the dish might be a bit bland (another impression validated by Mom!). I didn’t need to be concerned at all, though. While I did add a bit of salt and pepper, it was only a small amount – the flavors in this dish really come together beautifully. If you’re using the bacon, place the slices in the bottom of a Dutch oven and fry until crisp. Remove them, and brown the meat in the bacon fat (or use olive oil, as noted). Add the garlic, carrot, onion, wine, stock, and bay leaves. Cover and let simmer for about six hours. An hour before dinner, put 2 tablespoons of olive oil in a large saute pan and cook the mushrooms until they are soft (they will shrink). Add the mushrooms and pearl onions to the meat. Cook uncovered until dinnertime, about 45 minutes or so, to allow the sauce to thicken. Taste and adjust for salt and pepper, and remove the bay leaves. Serve on rice or noodles, or even polenta. 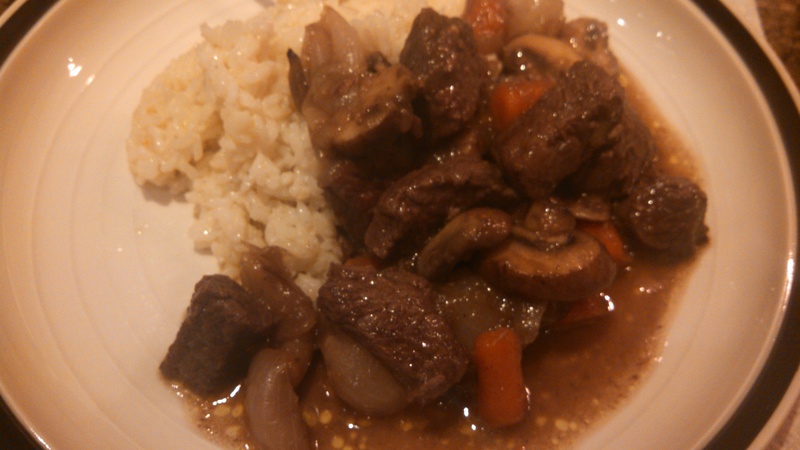 A few noteworthy tips: you can finish this recipe in a slow cooker the next day, if you like. Brown the beef as described, and cook the other ingredients in the mixture for about 30 minutes. The next morning, put the ingredients in the slow cooker and set it on low for the day. Also, as I noted on the ingredient list, I did not use bay leaves. I rarely ever (I would even go so far as to say “never”) use bay leaves, for several reasons. First is simply that most recipes call for one or two bay leaves at most – and when you buy them, you buy many more than that. Inevitably, the vast majority of the bay leaves I (used to) buy would spoil before I made another recipe that called for them. That’s just wasting money. Second, I once read that the addition of bay leaves has, at best, a minimal impact on flavor. I agree with this assessment, and the two combined factors are enough for me to disregard bay leaves on virtually all ingredient lists. Depending on your stove’s heat intensity, you may not need to simmer for 6 hours. 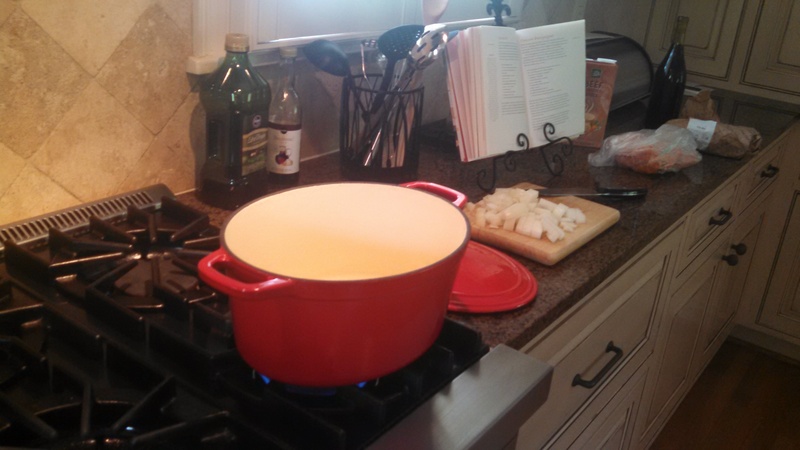 I’m still getting used to our gas stove, and the “simmer” setting is pretty intense – as I learned from this recipe. When I checked it at three hours, I removed it from the heat because the liquid had reduced significantly enough, all the veggies were soft, and the flavor was great. Categories: Eat, Weekly Recipe | Permalink.